As spiritual seekers, we recognize the value of preparing for death if we wish to live a meaningful life while facing death with as much confidence and consciousness as possible. Tibetan Buddhism provides a detailed guide and specific instructions for the death process, as well as prayers and practices to aid the transition. This course will include spiritual advice for living life meaningfully and preparing for the time of death, based on a detailed explanation of the death process as it is described in the Tibetan Buddhist texts. We will discuss preparing health care directives for the end of life. Guided meditations will be offered, including contemplation on the stages of death, and instruction in the important practice of tonglen (“Giving and Taking”). The practice of the five powers at the time of death will be presented, as well as details regarding the handling of ashes and memorials. This course is appropriate for health care workers, caregivers, those with terminal illness, or anyone who would like to learn more about this inevitable transition that we will all face, and learn to prepare for it with awareness and understanding. PRE-REQUISITE: It is helpful, but not required, for participants to have some background in Buddhist ideas and philosophy. Venerable Tenzin is authorized by the FPMT to teach at both the foundational and in-depth levels, and is also a teacher of Cultivating motional BEalance (a secular program developed by Alan Wallace and Paul Ekman). In October 2018 will complete the teacher training for Compassion Cultivation Training, a program developed by Geshe Thubten Jinpa and colleagues at Stanford University. Venerable Tenzin joined the faculty at Land of Medicine Buddha in August 2018. Lennie Kronisch is a Registered Nurse with a Master’s degree in Psychology. Her career has spanned birth to death; she has been an obstetrical nurse and childbirth educator, a psychiatric nurse, and was co-founder of the Holistic Health Institute in San Francisco. The last years of her career were with Hospice of Santa Cruz County, serving as a Case Manager and then as Coordinator of Volunteers. Lennie was Lama Yeshe’s nurse for the last few weeks of his life. After her retirement in 1998, she co-founded Tara Home, a hospice house located at Land of Medicine Buddha, with Ven. Tenzin Chogkyi and has devoted herself to its’ development ever since. She also led Buddhist meditations and talks for Road Scholar groups at LMB for many years. 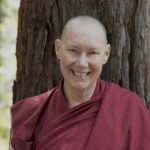 Lennie has been a student and practitioner of Tibetan Buddhism since 1975, when she met Lama Yeshe and Lama Zopa Rinpoche, and was personally honored by H.H. Dalai Lama as an Unsung Hero of Compassion for founding Tara Home. She has three children and four grandchildren and lives in Scotts Valley.